Vintage snowmobiling is hot — and vintage racing is even hotter. There are already a handful of dedicated vintage racing circuits including ROLA and SLEDS and even the USCC cross-country circuit is launching a vintage class this season. Need more proof? The Classic Vintage Weekend at Eagle River is set to eclipse in size the World Championship Snowmobile Derby it’s meant to prelude. The frugality of vintage racing is a refreshing break from what snowmobile racing has become, a high-dollar sport that takes a hefty bank loan to finance. Vintage racing is just as fun while harboring a fraction of the risk and if you crave speed it just might be your cheap fix. Here are eight sleds that will not only get you into the sport, they’ll also get you out on the track and give you the edge you need to be competitive right off the starting line. The El Tigre was Arctic Cat’s performance model in the 1970s like the ZR was in the 1990s. Cross-Country Cats like this were taken one step further and prepped for racing from the factory. The El Tigre was introduced in 1973 and was meant to be a trail performance sled and weekend racer much like the ZR would be in later years. Buyers could get “track-tuned” models ready to hit the races for those eager to get their feet wet in competition. The El Tigre supplanted the EXT and became Cat’s factory race sled but, unlike the EXT, they made a lot of them so finding one isn’t as tough as finding an EXT. 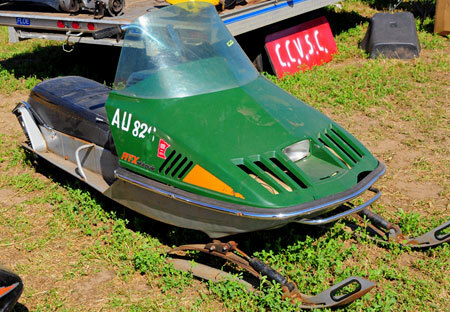 In 1973-1974, the first two years of El Tigre production, Arctic Cat made more than 30,000 of the track-ready model. Nice El Tigres can still be had for less than $1,000 and not so nice ones go for $200-300 all day long. The Cross-Country Cat models go for big bucks though. An El Tigre will make you competitive with little prep. The Polaris TX was Polaris’ staple performance sled for over a decade. TX-Ls and Starfires were the big boys, but a regular TX will compete with anything out there. Polaris built the TX model from the late 1960s all the way into the 1980s. The TX came with just about every different engine option, but the 295 and 340 were probably the most prolific. 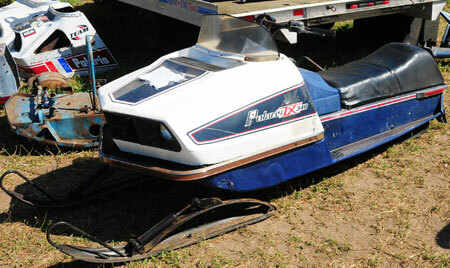 The Polaris race team used to race the TX model, but they used a modified version sometimes called the Starfire. However, the TX available to most consumers is the one you should look for and is a perfectly capable vintage race platform. There are also tons of parts being reproduced for them including complete hoods. In 1977 Polaris released the TX-L, a liquid-cooled version of the TX that conquered pretty much everything (including the I-500 that year) on the cross-country circuits. If you can find a TX-L, you can go faster. Get it. Ski-Doo built tens of thousands of T’NTs throughout the 1970s. T’NTs are good, T’NT Blizzards and RVs are better. Ski-Doo originally introduced the T’NT in 1969 as more or less a factory racer and produced the sled all the way up until 1978. Ski-Doo built thousands of T’NTs and you can find them with everything from a 292 single to a 440 twin. While the RVs and Blizzards became the more race-specific sleds as years went on, the T’NT never lost its performance pedigree. Plus, you’ll spend big bucks on an RV or certain Blizzards because of their rarity, so that makes the “regular” T’NT the way to go. The 1977-78 models feature Mikuni carburetors and slide suspension and 1974-1978 had a disc brake. 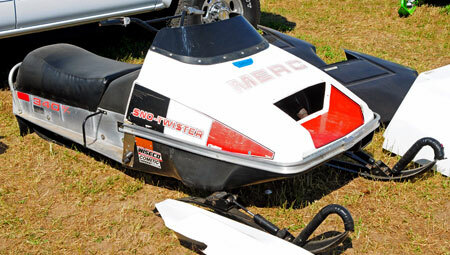 Hard parts are pretty easy to find at swap meets and the sleds are generally tough as nails. While Yamaha built a number of models that would make for a good vintage racer, the Enticer is hands-down the best choice because of it’s more modern parts makeup and the sheer number that were produced. 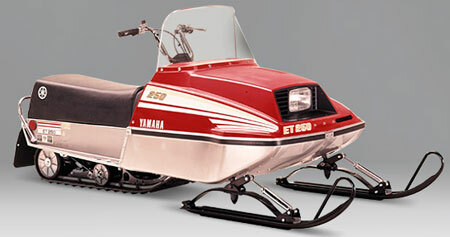 In 1978 Yamaha released the Enticer 250, a lightweight, single-cylinder snowmobile that offered a compact design and excellent handling. While not as racy as the SS440 or the SRV, the Enticer catapulted Yamaha into the sales leader position and the sheer number of Enticers available makes it a great choice for a vintage racer. Originally available with a 250 single or 340 twin, the sleds come with CD ignition, a rubber track and slide rail suspension and were produced into the early 1980s. In the vintage community the running joke is that anyone racing an Enticer is cheating because they run so well and never break. ‘Nuff said. Sticking to the four brands currently in production is the best bet when going vintage, but there are others to consider. Some should be considered because of their superior performance and some because a rabid following has created a parts support base. Here are a few we think should be considered but don’t limit yourself to these sleds. 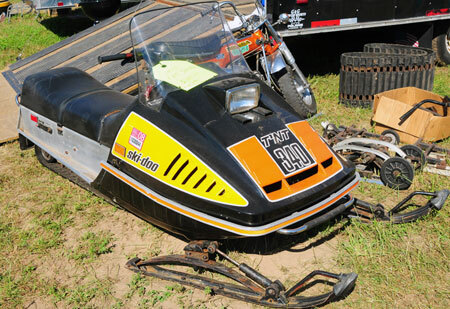 A vintage racer can come in many forms and companies such as Moto-Ski, Rupp, Brut, Sno*Jet and many others produced race-ready sleds. Remember, condition is king when shopping for non-currents. Mercury was heavily into racing for a few years in the mid-1970s and even today the Sno-Twisters and Trail-Twisters are considered formidable machines. Mercury was heavily into snowmobile racing in the 1970s, so much so that the race team built an exact copy of the Eagle River Derby Track at their test facility in Minocqua, Wisconsin, on which to perform racing R&D. The result was a line of snowmobiles that were more than capable of competing with the best any other manufacturer had to offer. The Sno-Twisters (1974-1976) and Trail Twisters (1975-1976) had a short lifespan and enjoy a cult following, so they are somewhat hard to find. But if you do find one it is a good buy because they are fast, well built and hold their value. They also have a loyal following so networking often produces parts. 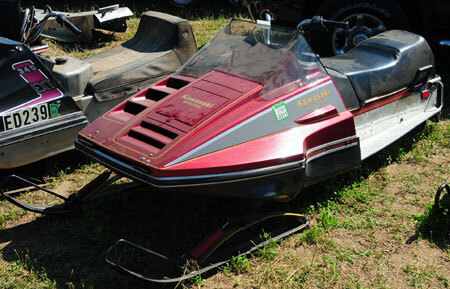 Though it was owned by Coleman for much of its existence, Skiroule was always a little fish when it came to snowmobiles. But when they went racing they came with guns loaded. Check out the rear suspension on this RXL. 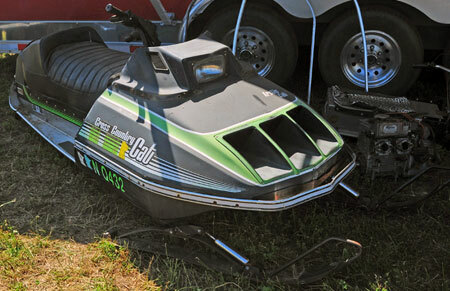 While only a small snowmobile manufacturer, Skiroule was a division of the Coleman company. In 1972 Skiroules underwent a major styling change and with it came a sleek and fast model, the RT and RTX. Built from 1972-1974, they came with everything from a 291cc Sachs to 437cc Kohler and Sachs engines. Back in the day they made for formidable race machines and featured an early version of a long travel skid. Today, they are hard to find in good condition, but if you can find one they are definitely fast and worth the effort. Though it only produced sleds for a few years in the late 1970s and early 1980s, Kawasaki came to bat with sleds that featured high build quality and were some of the fastest sleds on the snow, like this Invader. Kawasaki enjoyed a short, six-year run as a snowmobile manufacturer including the 1977 year when it produced its first sleds under the Sno*Jet name. In that short time span though, Kawasaki made some big waves. The Invader came with a liquid-cooled 340cc or 440cc engine, rubber track, aluminum tunnel and its fully adjustable slide rail suspension made them very fast machines. Produced from 1978-1981, they’re not as hard to find as you might think and they never quit running. 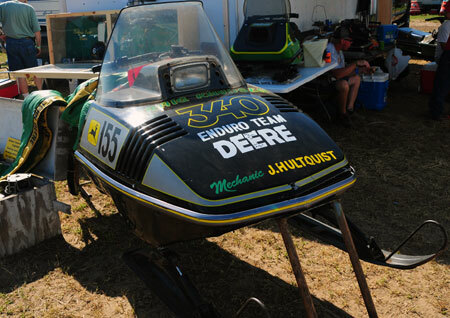 By the time the Liquifire came on the scene John Deere had learned a lot from its racing exploits and made the sled light, durable and fast. They were highly competitive machines on the cross-country circuits. Back in the day, John Deere implemented a huge racing program and relied on sheer numbers more than anything else to generate race results. That means they built a lot of sleds and it’s not hard to find one of those sleds even today. With a rich racing pedigree and construction close to that of a brick, they are a great choice for a vintage racer. The early 295/s and 340/s were good sleds, but John Deere took what it learned on those sleds to build the Liquifire from 1976-1978. If you’re lucky you can find a Cross-Country model or a sled that was outfitted with the racing kit.